I've read on marathon training web sites, that one can walk 5 kilometers (3.11 miles) at an "easy pace" in 62.5 minutes. I'd like to slow that down a tad. 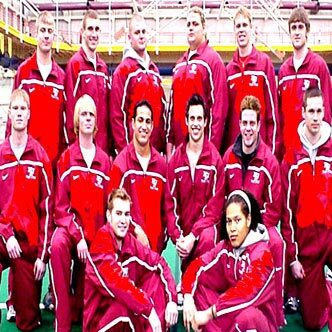 I'd like to slow it down with a group of like-minded noncompetitive "athletes". I want to race with people who are ready to say - "I'll finish this 5K when I darn well feel like it and only after I stop by the official MTAA Super Slow 5K refreshment stand for another hotdog". That's the race I want to run. 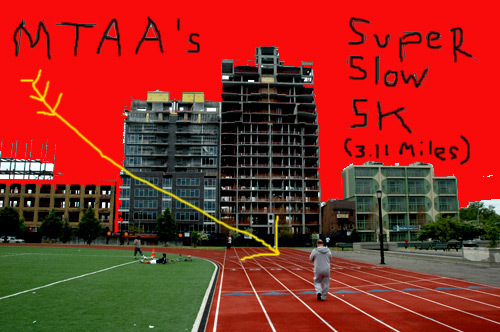 The MTAA Super Slow 5K is a one day race/group performance on the running track in Brooklyn's McCarren Park. Registration to the SS5K is free and open to the public. It begins at 11AM and ends when it seems right or 4PM, whichever comes first. Refreshments will be served, folding chairs and blankets will be utilized. The performance/race will be overly documented. "Celebrity" judges will be on hand to award trophies for "Best Dressed" as well as the coveted SS5K 07 "Mr. or Ms. Congeniality". Email superslow5K@gmail.com, sign-up on Facebook (you'll need a Facebook account) or just show up around 10:30AM the day of. Free and open to the public! No. It's free. You just need to sign up. Easy. 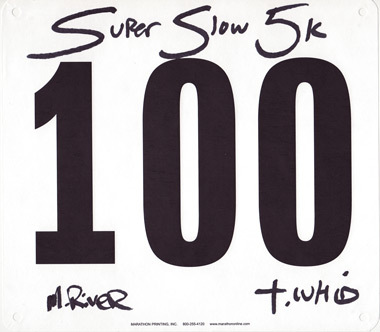 Just email superslow5K@gmail.com You will also be able to sign up at 10:30AM the day of the race at the track. It would be cool if we all started together at 11AM but due to the laid back approach to this race we understand that some if not most of you will be late. Just head to the track and find race official T.Whid on or near the race picnic blanket and lawn chair (at the northeast corner of the track). Once you find T.Whid, just sign in. How do you keep track of the race? Each racer will be given a bib / limited edition print to pin to their shirt. You know, like those number things you see in marathons. Also, you will get a score card to check off how many laps you've completed. In compliance with the SS5K vibe, we are relying on the honor system here. How many times around the track is 5k (3.11 miles)? 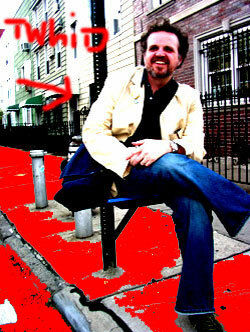 McCarren Park's cinder track is .25 miles around. So, it's around 12.5 laps. Yes, you can do it. Can I just run the 5K or do I have to go slow? You can run, jog or walk. Take breaks if you want or run it full out. It's up to you. Can I wander off the track? Yes, it sounds like a lot of stuff is going on that afternoon in Williamsburg and we encourage you to see the neighborhood. 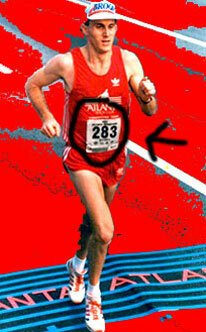 Just make sure to keep your numbers on so that people know you are in the race. No, but around 4PM we will be getting together for the big wrap-up, award ceremony and group hug photo-op. Yes. We will set up a SS5K picnic blanket/lawn chair/grill area with snacks, games and pillows. Also, we are planning on grilling some hot dogs and soy dogs but who knows how long that can last. Feel free to bring some treats to toss on the grill. Will you have drinks (wink wink)? We might. Plus, we will also have water to keep you hydrated. Can I take a nap during the race? So basically this is some sort of group picnic/performance art/photo-op/hang out with a 5K non-race on top. That's not a question but yes, you've summed it up nicely. We hope you will join us.